Life is full of surprises. They are often not pleasant but they do make life interesting. I’ve found vacation surprises often make the most memorable events. Cruising in the Caribbean, one of our stops was at Progreso, Mexico, a port not known for excitement. The Yucatan is a beautiful area and the climate is perfect but there is little to do at the port. We booked an all-day excursion to tour one of the ancient Mayan ruins. The bus ride was a sleepy hour and a half on good roads and in light traffic. Our Mayan-Mexican guide did his best to keep us awake bragging about his amazing ancestors and teaching us some Mayan words which we promptly forgot. 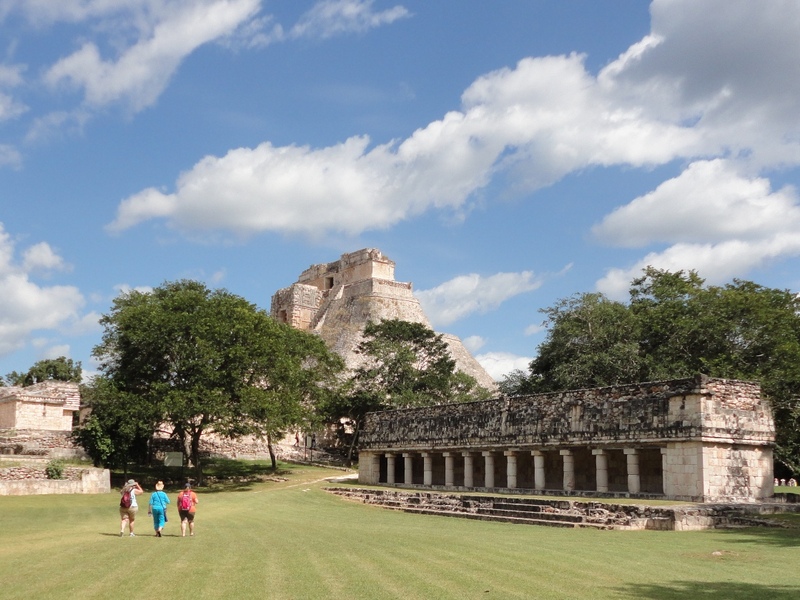 He helped us explore the city of Uxmal, one of the best-preserved of the ancient civilization. He said it was founded around 500 A.D. and was the Mayan capital city from 850-925 A.D. We saw the restored ball court and learned that the winning team captain was sacrificed to the rain god Chaac, or perhaps to Quetzalcoatl, the feathered serpent. Anyway, winner gives up all for the sake of his community. We took scads of pictures of rock carvings and stone arches that have survived the rain and jungle for over a thousand years, not to mention the destruction by Spanish conquistadores in the early 1500s. Why would anyone want to climb it? see if he could. I went shopping while Dan tried to figure out how to get back down. He got a thrill and I got a little art print of yellow birds. We then rode the bus to the Hacienda Ochil, a henequen plantation built in the 1700s by the Spanish. Henequen is a type of fiber obtained from Agave plants, similar to sisal. The locals still use it to make placemats, coasters, baskets and other pretty handicrafts. At Ochil, we refreshed ourselves with a sweet hibiscus drink and meat-filled botanos (fritters). We browsed through the museum and gift shop and ambled back to the bus, ready for the long trek “home” to our ship. I malingered, enjoying the beautiful tropical palms, birdsong and balmy weather as I popped in and out of the buildings. As I neared the parking area, I was surprised to see our entire group standing in the shade, chattering excitedly because the bus wouldn’t start. Our tour guide was the last to arrive, having rounded up the herd, paid the restaurateur and visited with a few friends. He quickly called for a replacement bus, assuring us it would arrive in twenty minutes or so. He said we would make it to the cruise port in plenty of time. We touristas didn’t feel so confident, having heard horror stories of passengers being left on the dock. When we found out the bus had a manual transmission and could possibly be started by pushing it and popping the clutch when it started rolling, a group of men gathered around eager to try. Dan pushed, along with half a dozen others. I took pictures and laughed and thought, Only in Mexico! Feeling confident the cruise ship wasn’t about to sail away and leave forty paying passengers stranded in Mexico, I decided to enjoy the aberration. They pushed the bus forward, up a slight incline. The driver released the clutch too soon and it didn’t work. Now we were blocking someone else’s bus ride home, which I found hilarious. The men tried again, this time from the front and pushing the vehicle in reverse. Hmmmm. It seems the parking lot was inclined in that direction also. Another fail and more groans and laughter. After four tries, the bus got up enough speed for the engine to engage and we had motor power. Hurray! Our hot and sweaty crew piled in, the driver cranked up the AC and we were off, much more awake than we thought we would be. We were a noisy bunch as the guys told their stories of hot metal, shoes slipping on gravel and frustration at ineptitude and the women exclaimed over photos. Back on the ship (just in time), too tired for dinner and too hungry to wait, we ate pizza for our supper and soft-serve ice cream for dessert, went to bed early and dreamed of the next day’s adventures in Cozumel. We could only hope they would be as memorable as pushing the bus in Progreso. Quote | This entry was posted in Short Takes on Life and tagged Hacienda Ochil, Mexico, Pushing a bus in Mexico, things that go wrong on vacation, touring Mayan ruins at Uxmal, vacation memories, what to do in Progreso. Bookmark the permalink. Hahahaha!!! Thanks for the laughs, the humor, the beauty, and the great visuals!!! I agree, felt as if I went along on this one. and, loved tripping over the Spanish too, sorry for the pun. love my birds birds. thank you sweetie!